You know that question you’re sometimes asked during job interviews about “If you could go back in history and meet anyone, who would it be?” (frequently also followed by “and why?”) The answer for me – and countless other blues fans, no doubt – would have to be the legendary Muddy Waters, with the “why” having a lot to do with the story of Muddy’s musical journey from the Mississippi Delta to the clubs of Chicago, where he helped inspire a whole new generation of musicians both home and abroad, among them, a group of lads from London who took their name from Muddy’s “Rollin’ Stone” and would become one of music’s biggest acts ever. Having never had the chance to experience a true live performance from Muddy, I’m always interested in new videos of the master in action. So when I heard that this one also included guest performances from fellow blues greats Buddy Guy, Junior Wells, and Lefty Dizz, I knew I’d have to check out. And oh yeah, that group of lads from London is here as well. It’s fun to watch the interaction between the two singers – Mick’s flamboyance and energy serving as a stark contrast to Muddy’s more laidback, seated country style – yet you can easily sense the mutual admiration these men hold for one another, each fully aware of the debt owed the other: Muddy, for introducing Mick and so many others to the blues, and Mick, for introducing Muddy’s music to the rest of the world, helping Muddy and other bluesmen get the attention they so rightly deserved (and may not have ever received otherwise). By the time they get to “Mannish Boy,” it’s obvious that Muddy is feeling quite inspired by the Stones’ presence and probably somewhat flattered by their admiration, moving him to his feet to do a little bit of dancing as well. It’s also at this point that Muddy brings yet another big name to the stage in the well-dressed Buddy Guy, whose first order of business is provide Mick a big hug. 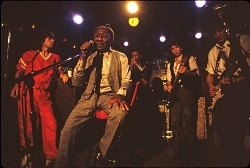 With Muddy to his right and Buddy on his left, Mick is visibly awestruck as the two blues greats trade vocals, with Buddy then taking his place on guitar as Junior Wells and Lefty Dizz come to stage for a turn on vocals. 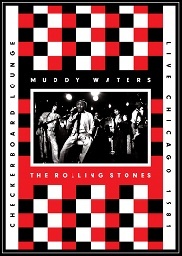 With Muddy and Mick ready for a break, Junior Wells takes over the show on vocals and harmonica with “Got My Mojo Workin’,” also now joined by the Stones’ Ian Stewart on keys, as Buddy, Keith and Ronnie tear things up on guitar. An impressive guitar solo from Buddy kicks off a fiery “Next Time You See Me” that provides a couple of nice jams between the host and the Stones guitarists, with Junior relieving Buddy on vocals partway through while Lefty more than holds his own on guitar. Having now reached his turn on vocals, Lefty’s fine playing continues on the humorous “One Eyed Woman,” performed with so much energy that he at one point backs right into Keith. An instrumental “Baby Please Don’t Go” also allows Lefty to break things down nicely on guitar, including some great interplay between the bluesman and Ronnie, before Muddy returns to the stage with “Clouds in My Heart,” where he directs an auditory smorgasbord on guitar with solos from Keith, then Ronnie, then Primer, and finally, Lefty, for one of the night’s most memorable segments. Another pretty memorable moment comes just a short time later when Muddy is again joined by Mick for the disc’s closing “Champagne & Reefer,” during which someone produces a stash that Muddy picks up and sniffs, prompting first a look of surprise, then amusement. Of course, there’s no need for champagne or reefer when the music is this good, and those left hoping for more will be glad to learn that the DVD also includes two bonus tracks: a “You’re Gonna Miss Me When I’m Gone” from the same night that provides another nice look at Muddy’s band, with Primer on vocals as well as guitar, and the Stones performing “Black Limousine” during a 1981 show on a much bigger stage at the Hampton Coliseum. Although the size and crowdedness of the stage and club itself don’t allow for a whole lot of artistic camerawork, the photographers did manage to collect a rather nice variety of angles and shots to capture both the intimacy of the setting and these artists at work, with plenty of close-ups of the singers and musicians throughout the night and fuller stage and audience/stage shots when needed. The truth is, this DVD would qualify as a treasure even if the camerawork were only half as good, allowing those of us who weren’t there to still serve as witness to the historic gathering. While you can of course purchase just the DVD, you’d be crazy not to spring an extra five clams for the DVD/CD set, with the CD (previously available only as a bootleg) including all of the songs found on video except for “Country Boy” and the instrumental “Baby Please Don’t Go” and being as pleasing aurally as the DVD is to watch. Or, if you want an even more authentic sound, wait for the DVD/LP set due out in early September, but one way or another, you’re going to want to add this one to your collection. This entry was posted in Albums and tagged Buddy Guy, George Mojo Buford, John Primer, Junior Wells, Keith Richards, Lefty Dizz, Lovie Lee, Mick Jagger, Muddy Waters, Rolling Stones, Ronnie Wood. Bookmark the permalink.